Since the end of the Z series, the Super Robot Wars games have tried to change up the setup somewhat, such as including series without mecha in Super Robot Wars V. Well, the latest Super Robot Wars X follows on from that and but a fresh isekai angle to the mix. From the start, Super Robot Wars X wears its isekai, or alternate world, intentions on its sleeve. With the inclusion of such series as Aura Battler Dunbine and Machine Hero Wataru, the whole premise feels very fantasy themed. Something that is only emphasized further with the main OG mecha being a magic-oriented unit. However, Super Robot Wars X does have its fair share of Gundam and more science fiction-oriented series included as well. On the former, we see the return of the Hi-Nu Gundam and the Nightingale for the first time since Alpha 3 and Reconguista in G also gets some nice amount of attention as well. Compared to prior mainline console releases, Super Robot Wars X is quite straightforward, somewhat on the short side and rather easy. That said, none of these things actually detract from the game, as the package of content here is well balanced overall. To explain, normally on the bigger console releases you tend to have multi-unit parties, but Super Robot Wars X eschews that for single units, as per the classic games, but still retains the 3D isometric grid map setup. This means you don’t need to worry about formations and the like, instead you simply focus on taking down your enemies. The backend is also quite streamlined, despite being rather involved. You can upgrade your mecha and equip various parts to improve their performance. Pilots can also be tuned and have their abilities enhanced or whole new skills added. The factory also allows you to buy special parts as well as sell ones you don’t need, not to mention do game wide upgrades on how you earn experience and upgrade currency, among other things. One nice feature is the ability to train and use pilots that aren’t in your main line-up. This means you can help keep your pilots and their mecha relevant, as they earn you cash and experience points. This too is somewhat automated and you can auto-fill the pilots just to get the cash or stat boosts you need. So the result of all this is a game that feels very direct in strategy, while backed up by a very streamlined backend unit management system. In short, this feels like a game aimed at mecha fans that are not overly familiar to the Super Robot Wars series and that in itself is no bad thing. The missions are also not overly complex and don’t tend to have special objectives in order to succeed. The SR points per mission are still present and acquiring those can be fun, as the requirements change quite a bit, but overall the missions are generally pretty straightforward. This in turn ties into the game’s overall difficulty and it is safe to say that this is not a difficult game. If you manage your units properly and upgrade them after every mission, you will quickly end up with a roster of monsters that can often complete each mission on their own. The final boss is also not at all difficult and can be dealt with quite easily. In addition, the game comes in at around 50 missions in all and that feels a bit on the short side. To be fair though, you have multiple routes through the game, as per older games in the series, as well as two main characters with different endings apiece. Not to mention all the secrets you can unlock. For me though, being able to use the Sirbine alongside the mighty New Nautilus, while the Hi-Nu Gundam brings up their rear is very nicely done. This is because the battle animations are simply stunning throughout and are effectively at the level of actual anime now. To the extent that most attacks feature re-purposed elements from the host anime itself, with both Nadia and Wataru being good examples of this. While I still rate the roster of Alpha 3 and BX quite highly, the mecha you have available here are at least as good. 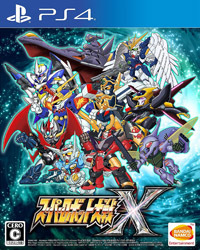 Admittedly, if we had some Macross, Dancouga and Layzner units to play around with as well, then that would have made this the perfect Super Robot Wars game for me but the sheer love for Dunbine alone in Super Robot Wars X almost makes this game. That said, considering the whole isekai aspect and the subsequent emphasis on Dunbine, the absence of series like Escaflowne does feel like a missed opportunity. All this aside, even though Super Robot Wars X nails it in depicting the various mecha from the array of host anime included, the game itself is solidly done and is focused with it. Even though it is clearly aimed at bringing newer people into the Super Robot Wars series, there is still enough here that is done well to keep long-term fans very happy and as such this comes highly recommended. This review was undertaken on both the Japanese PlayStation 4 and PlayStation Vita versions of the game. In addition, the version played was that of the premium sound release, which includes the original songs from each of the host anime included.